For a moment, all eyes were on South Boston state Representative Nick Collins as he slowly stood up in the low-ceilinged hall inside the Michael J. Perkins American Legion Post #67 at East Fourth and O streets. Several dozen of the neighborhood’s politically connected glad-handers were gathered around small round tables. A mere three years ago, Collins threw his weight behind then–City Councilor John Connolly for mayor, working hard to lock down votes in the battle between two Irish-American mayoral finalists. 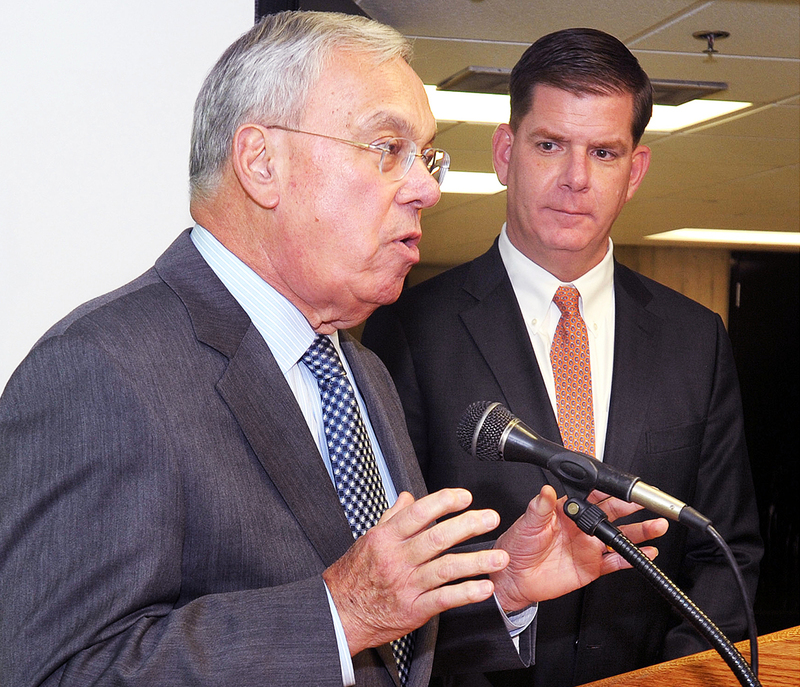 On this day, though, Collins rose to publicly change course: More than a year before 2017’s election for mayor, he endorsed Connolly’s former opponent, a son of neighboring Dorchester, and pledged his support to Marty Walsh. Collins wasn’t the only one. Southie’s city councilor, Bill Linehan, and at-large councilor and one-time mayoral candidate Michael Flaherty made the same endorsement. Though their formal, public announcements will come later, here were three of the most important pols in Southie committing themselves and all of their political might to Walsh in front of their district’s key power players. When it comes to this year’s race for mayor, this highly choreographed scene—which has already recurred in East Boston, Charlestown, and Dorchester—sent a signal as clear as the reported $3 million in Walsh’s campaign bank account: Resistance is futile. Anybody thinking of running against Walsh in his first bid for reelection will find nothing but barren fields to nurture such an effort. As of this writing, there is no sign of a serious challenge to Walsh in 2017. The only name being mentioned at all is Roxbury City Councilor Tito Jackson, who has emerged as a leading voice of opposition, particularly on education issues, but who has virtually no funding. At a time when contenders should be amassing imposing campaign war chests to dethrone the king, the election so far looks like a game of Red Rover, with only one team lined up. But why? At least on paper, it seems odd, even shocking, that aspiring wannabes would let Walsh coast to a second term without a fight. He won the office in 2013 by a slim margin of fewer than 5,000 votes, and many political observers believe Walsh would have lost if a black or female candidate had survived the preliminary election, instead of Connolly—suggesting that such a candidate could beat him now. During Walsh’s three years in office, tangible accomplishments have been scarce, while high-profile setbacks have included federal indictments of two administration officials, crises at Madison Park Technical Vocational High School and Boston Latin School, and derailed dreams to host the Olympics and an IndyCar race. We certainly know that Boston has no shortage of ambitious politicians who dream of moving into the fifth floor of City Hall. So why does it seem that everyone is set to rubber-stamp a second term for Walsh? After discussing that question with a range of political insiders—including Walsh himself—I’ve come away with a handful of contributing factors. Whether you choose to give Walsh the credit or not, he’s mostly right: Boston’s unemployment rate is low, home values are up, and most people feel safe walking their streets. Bostonians, on the whole, are pretty happy these days. Why change? Sure, not every neighborhood is experiencing the boom times equally—something Walsh concedes he’d like to make more progress on—but there aren’t enough people being left behind to fuel a large opposition. Even small, long-overdue steps to drag the city into the 21st century—including data tracking of city services and attempts to brighten City Hall Plaza—look like great leaps forward after two decades of Tom Menino’s old-school ways. Others have made the same point: Over the years as a labor leader and state representative, Walsh put up signs, pushed for legislation, offered counsel, or helped out a constituent for almost every politician in Boston. And he’s been a nice guy every step of the way. “People like the mayor,” says state Senator Linda Dorcena Forry. “He’s a Dorchester kid who was born and raised here.” Plus, Walsh has wisely co-opted potential challengers by bringing them on board at City Hall. John Barros, Felix Arroyo, and Rob Consalvo, three well-regarded mayoral candidates from 2013, all work in the Walsh administration. It would be virtually impossible for them to turn around and run against Walsh’s record, or back an opposing candidate, even if they wanted to.